Oval-anchored stalked jelly attached to seaweed. Photos by Matt Morrison (left) and Jenn Burt. 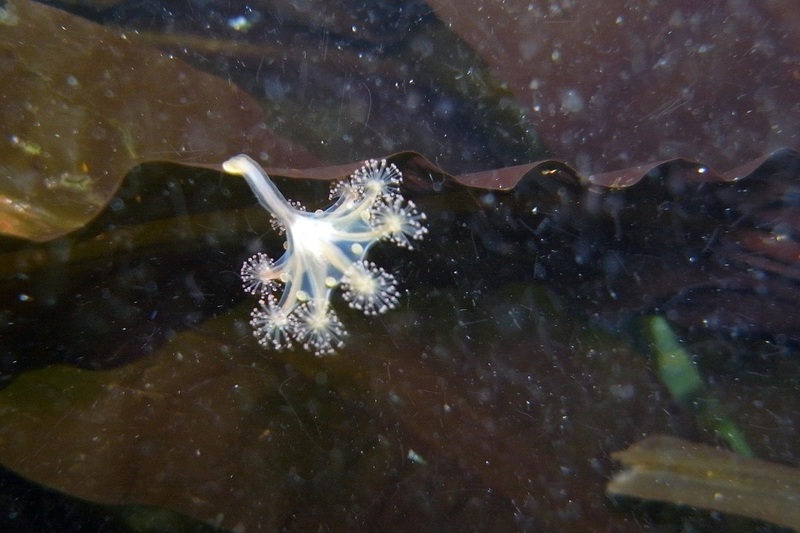 This small stauromedusa species has an attached stalk that splits into eight brush-like arms, with ends tipped with anchors and fringed by tentacles. It gets to 3 cm long and varies in colour: it may be orange, yellowish, brownish, or greenish. 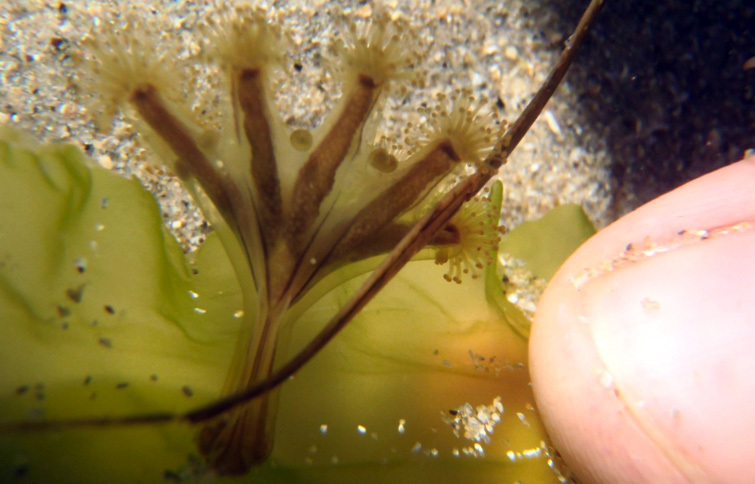 This jelly attaches to kelp and seagrass in the low intertidal and subtidal to a depth of 10 m. It has been recorded from northern Alaska to Puget Sound, Washington. Other stalked jellies exist in the Pacific Northwest south of the Central Coast, including the trumpet-shaped Haliclystus salpinx and the goblet-shaped Manania handi. Cowles, D. (2004). Haliclystus sp. Invertebrates of the Salish Sea. Rosario Beach Marine Laboratory. Accessed 15/01/2014. Harbo, R. M. (1999). Whelks to whales: Coastal marine life of the Pacific Northwest. Madeira Park, BC: Harbour Publishing. P. 69.